The ‘Comprehensive Economic Trade Agreement’ (CETA) is a free trade agreement currently being finalised between the EU and Canada. This agreement vies to reduce non-tariff barriers between the two nations, attempting to harmonise standards and regulations across numerous industries. This bi-lateral free trade agreement has been negotiated in secret since 2009 with negotiations ceasing during a ceremony in Ottawa in September 2014. The negotiation process has been met with much vocal criticism from multiple NGOs and Civil Society Organisations from both sides of the Atlantic. This is due to one the most controversial aspects of the agreement, a private court mechanism called “Investor State Dispute Settlement” (ISDS) – whereby its inclusion could inevitably unleash a wave of multiple corporate lawsuits against Canada, the EU and its member states. The ISDS mechanism gives foreign corporations the ability to directly sue a national sovereign state at private international tribunals for compensation over a potential loss of profits. Previously, this mechanism has been enacted and utilised by big businesses in industries such as: health, environmental, financial and other domestic safeguards that they believe undermine company’s rights. These investor-state lawsuits are decided by private commercial arbitrators who are paid for each case they hear with a clear tendency to interpret the law in favour of investors. This free trade agreement is one of many being negotiated around the world, in addition to others, such as; Transatlantic Trade and Investment Partnership (TTIP), Transpacific Trade Partnership (TPP) and Trade In Services Agreement (TISA). These free trade agreement offer the possibility of enhancing the rights and opportunities of multinational corporations to dictate and set the agenda in regards to trade, even though the EU is already willing to allow these corporations to have special treatment in a formal court setting. 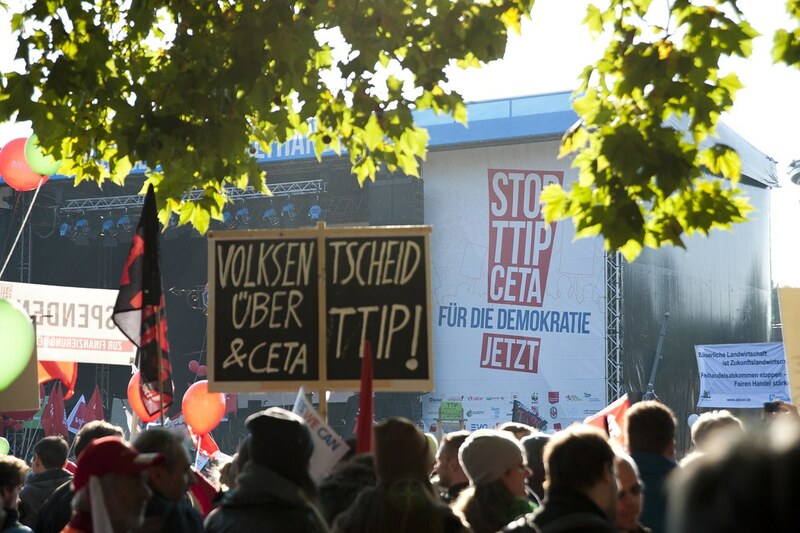 TTIP, the free trade agreement between the US and EU has been met with criticism and has garnered great attention with nearly four million people signing a petition to halt talks on the agreement. Oppositely, many people are unaware of the dark horse that is CETA and consequences this agreement can impose. For example, the potential success of CETA will also allow for US multinational corporations to use this agreement as a backdoor into ISDS cases, arguing their “corporate rights”. In a public consultation held in Europe, over 97% of respondents rejected the introduction of this new power for businesses. The ISDS court is judged by an arbitration panel, composed of corporate lawyers who make judgement’s based only on fact and empirical evidence in regards to policy relationships with a company’s potential loss of profits, therefore specifically acting in the best interest of the company at hand. The question that bares is: where does the interest of the government or public lay? Unlike traditional court hearings, rulings in ISDS inevitably and with bias, side in favour of corporate profits at the expense of EU governments. Cecillia Malstrom, the European Commission for Trade has even stated ” The mandate for the EU is to big business not to the European people”. Like Malstrom, numerous other EU governments were unhappy with the final text agreed by the negotiators, however, it was still passed regardless. No MPs or TDs were allowed to take part in the talks, which were carried out in secret with access only being granted after the text had been finalised for proposal to Canada and EU member states. There has been much discussion regarding CETA and the significance of this agreement on retaining key elements of public service that are being bargained away without a shred of public debate. In Ireland the discussion has been regarding the potential privatising of Irish Water, while in England there has been much discussion regarding the privatising of their health service the NHS. If we look at previous free trade agreements as a basis for understanding, we can see that the “proof is in the pudding“ – so to speak. Canada’s submission to big businesses with its inclusion in the North American Free Trade Agreement (NAFTA) illustrates the dangers of investment arbitration, although the agreement is with one of their closest geographical allies being the United States. Canada has been sued 35 times, has lost or settled six claims and has paid damages to foreign investors amounting to over 171.5 million Canadian dollars. Ongoing investor claims challenged a wide range of government measures, thereby diminishing the value of foreign investments. This included moratorium on fracking and a related revocation of drilling permits to a decision by Canadian courts to invalidate pharmaceutical patents which were regarded not sufficiently innovative or useful. Foreign investors are currently seeking several billion dollars in damages from the Canadian government. War on Want, an anti-poverty organisation, describe it as “one of the ‘new generation’ of trade treaties on behalf of big businesses that are set to undermine our democracy and destroy our basic rights”. Maude Barlow, an activist and member of the Council of Canadians has been travelling across Europe, warning people about the potential dangers these types of free trade agreements pose to society through public debates. Barlow bases her opinion on Canada’s almost 30 years of experience with free trade due to its signing of NAFTA an agreement between the U.S. and Mexico.